Party for the Purple People with storyteller Margaret Clauder, Grades K-1 (May 2007)--2 different t-shirt designs! 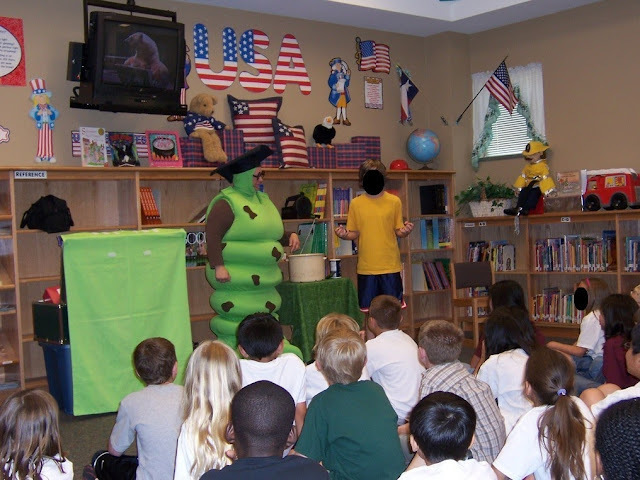 Before I landed my middle school library position, I was an elementary librarian for five years in Keller ISD in Fort Worth, TX. Our school didn't have AR or Reading Counts or any of the other "reading incentive" programs available. We were a brand-new school, so we had no established reading program. It was my first year as a librarian, and I was excited to create a new one! Some of the librarians in Keller ISD at that time used something called Reading Olympics, which I think was either created or adapted by another elementary librarian in KISD. The basic premise was that students read certain types of books in order to earn medals. For example, to get a bronze medal, a student might have to read a Caldecott winner, a Newbery winner, a book by one of a list of authors, etc. They would have to read maybe 7 books on the bronze list in order to get that medal. I liked the idea of Reading Olympics and the way there were "types" of books rather than a specific title list, giving students more choice in what they read for the program. When I originally set out to create Reading Bingo, I wanted to base it on Reading Olympics but add a visual element to it, rather than recording titles read on reading logs. As a former 7th grade English teacher, I came to hate reading logs, and my students hated them, too. Boxes on Bingo cards would work perfectly, and Reading Bingo was born! Since I created this program in 2005 and have shared it all over the place, I'm sure it is already out there, and I have seen lots of other Reading Bingo cards on Teachers Pay Teachers and other websites. Librarians interested in using these might want to download them and update some of the authors and books listed since I last used these in 2008. All my RB materials below are 100% free to use, modify, and share as you need. Students and their parents at my school got very excited about Reading Bingo, and that is a great thing! However, some got so gung-ho about it, they started turning in cards a day or two after starting them. While it may be possible to read 25 elementary-level books in 2 days, I really don't recommend that. I want students to savor their reading, to think and talk about it, not just read as fast as possible to get the prize. My solution was to stamp the current due date (2 weeks into the future) in the corner of each new card I gave out. The student could not turn in his/her card until after that date. So even if little Mary finished her card in one day, she had to wait until that date to turn it in and get the prize. This gave the students (and in some cases, their parents) some time to slow down and enjoy their reading, rather than be so focused on just finishing. The card was not DUE on that date; that date was the first day they could turn it in and get a new card. I did not give out the new cards until they turned in their finished one, so they could not start a new card until that day, either. Students had all year to work on their cards, and I also allowed them to start them over the summer for the next school year. This program allows for differentiation by design. Students select their own books, and there is an unlimited number of reading choices for many of the squares. For example, on the 3rd grade orange card, one space is "a book with a Y in the title." How many books have a Y somewhere in the title? It could be fiction, nonfiction, biography, a graphic novel, etc., as long as there is a Y in the title. For special education students or those who struggle with reading, librarians can work with teachers to modify the card by allowing a student to do a card from a younger grade level or allowing the student to read 15 squares instead of the 20 on the card. GT students might be allowed to read from higher grade-level cards, or they could simply select higher reading levels within that category. Librarians could allow substitute categories for certain squares to increase or decrease difficulty. charms and key chain clips available at Oriental Trading--really inexpensive with tons of designs! I offered about 36 different charms each year and changed them from year to year. I also had "special edition" charms for holidays--they were only available for students to win for a limited time--this was extra encouragement because once they were gone, they were gone! "Special edition" charms were also from Oriental Trading. Enter "enamel charm" into search box on their site for a full list. You also need something to organize your charms. There are lots of jewelry organizers available from craft stores, but we found that empty egg cartons worked great. We assigned each charm design a number, which we wrote in Sharpie inside the top part of each egg hole in the carton. We also made cards for students to use when selecting their charms. We used library tape to tape each charm design to cardstock paper and included the number. Students just asked for the number. These cards were on display in the library so the kids could "browse" the charms as often and for as long as they wanted. All Purple party participants also got a free t-shirt--a local t-shirt company (Groggy Dog Sportswear in Denton, TX) designed our t-shirt each year. I used their online Contact Form to request a design. I described what I wanted, and they emailed me a design prototype for free within a few days. We had a different design each year since many students participated year after year. I gave any t-shirts left over at the end of the year as a thank you to those teachers who really helped promote Reading Bingo or offered them for sale to teachers/faculty members only at cost (about $6.50 per shirt). Thinking about Reading Bingo for your school? I recommend you open a card (below) and read the directions first so this post makes more sense. There are six cards for each grade level from grades K-4. My students completed the cards in rainbow order (red, orange, yellow, green, blue, purple), and each card was printed on corresponding colored paper. One side of the paper was the Bingo card; the other side was the rules. The parent or teacher only had to sign the card once at the bottom, not after every book. The rules state that only parents can sign for a student, but I did allow teachers to sign for those students who needed someone else to sign it for whatever reason. The teachers know the students' situations better than I do. If you have questions about how I implemented Reading Bingo at my (former) elementary school, please post in the comments or email me! I'd love to help!!!! This sounds fabulous. However, when I click on your links, it opens Google docs, but I can't see anything. Hmm...let me check it. I made them public links, but it's hard for me to check them while I am signed in. Thanks for letting me know--working on it now. What did you use for your 5th grade? @Karen Hart--Our school was only K-4, so I didn't make 5th grade cards. Do you have 5th grade cards made yet? I love your idea for students to earn charms...how did this work for the boys? I work in a 4-6 building and can see how the charms are a real incentive for the girls, but a bracelet for the boys? I don't want this to "flop" if I'm going to invest money into it! Thanks for the great ideas and resources! @Anonymous 8:33AM--What a great question! I actually did not do the charms for charm bracelets (although some girls might have done that on their own). We purchased empty keyrings to attach the charms to. The boys loved them! They attached them to backpack zippers or house keys. I got our keyrings from Oriental trading for very cheap (like 100 rings for 3.99). @Anonymous 8:33AM--Also, if you click on "keychain clips" in the post above (under "prizes"), you'll see some boy-friendly keychain clips they could collect their charms on. This is an awesome idea! Thank you so much! I think I can try this out. I love this idea. :) How did you suggest this idea to your principal or did they ask you to come up with a reading program? I can see that this gives the library as much recognition as PE-Running Laps braclets, Music-Choir programs & Art-artist of the month. email: purplelady913@yahoo.com thanks for this great idea. Awesome idea! I will bring it up at our next Pto mtg! Were six cards enough for all of your students for the whole year? Did some kids repeat them? Donna T--There were 20-25 books on each card, depending on grade level, so 120-150 books total for the year. No one repeated any that I remember. Jamie--So sorry about the delay! I am trying to catch up on summer comments, and there are just a lot of them! Yes, I just added a link to a blank template in the post above. If you want a digital copy, just email me and I'll send it. Thank you for sharing such a wonderful idea. I cannot wait to start this in my K-4 library this year. One question, did you the charms fit on the split rings or did you need additional hardware? I can't tell online if the hole in the charms is large enough to fit over on its own. Thanks! llinck--Yes, the charms I got from Oriental Trading fit split rings. We bought those from OT also. Definitely invest in split ring and needle nose pliers as well. You can get a set of 3 from Hobby Lobby for less than $10. So worth it! Did you purchase your shirts earlier than the end date? If so, how did you decide sizes and quantity? Thanks! llinck--Yes, I purchased them early in the school year so the students could get the t-shirt as soon as they completed their final card. I purchased 50 shirts in the 2 most popular sizes at the end of the school year so they would be there by the first day of school. This way, I could show them off right away and drum up all that excitement! As I ran out of the shirts, I ordered more as needed--our minimum order was 50--and kept the extras for students who finished early and wanted to start all over to get the previous year's shirt. I never put the school year on the t-shirts for this reason. What would you say your percentage of students in your school participated? I am looking to start this year, but to have all the materials (6 charms plus key chain clip) for my entire student population of 600 students is an alarming $800! Do you think I should start out with less? Anonymous Aug. 7--Yes, definitely start with less. You can always add more later once you gauge participation. You could also phase it in with the younger ones and as they advance to the next grade level, the program adds a level. At my school of around 900, we had just over 100 students finish all six cards in the third year. As with all new programs, participation sometimes takes a couple of years to take off. The first year, there were maybe 50 students who completed all six levels. Along the way though, we had 3 binders full of completed cards. I would say at least half the students completed at least one card in that third year. 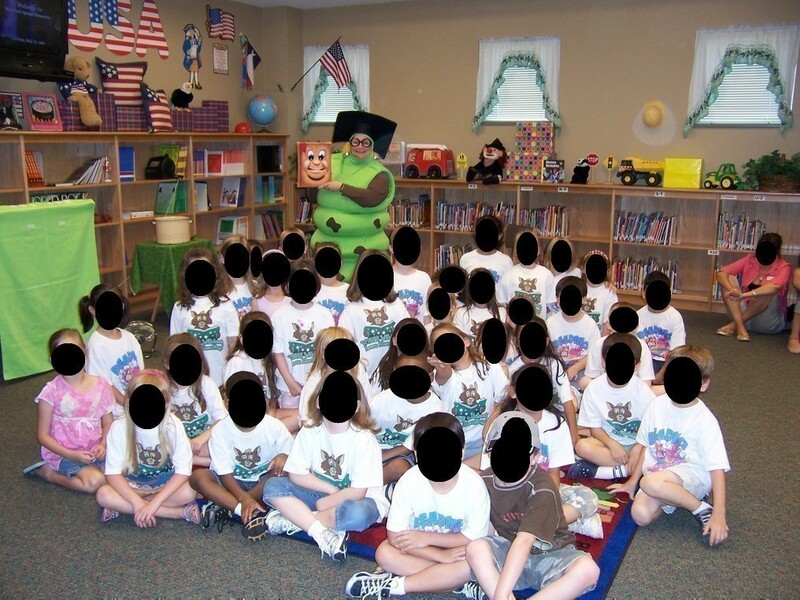 For all three years I was at the school and doing this program, Grades K, 1, and 2 were the biggest participants. It's been 6 years since I left that school, and they are still doing Reading Bingo, so it has been going strong for about 10 years now. Thanks so much! I used Fitness Finders for our prizes! Kids love them so far! What a great idea! May I please have a digital copy sent to my email? pdarr@npsd.k12.wi.us Thank you! I would love as much info as I can get. This will be my first year in an elementary school and they don't have a reading program. My email is lupin@gmail.com. Thank you! I really like this idea and am going to try it with the entire school. I want to try it out by class rather than individual student. Our students don't have a lot of support at home when it comes to reading so I am going to try and make it work. Best of luck, Keesha! Please feel free to email me if you have any questions. I love how flexible the Bingo program is--very easy to differentiate. Thank you so much for sharing! This is great...I can't wait to implement it in our library! I noticed that there is a "turn in on or after date" on each card...did you give students a specified date individually as they received new cards? Thanks! I used the due date stamp to post-date each card by two weeks. The student was not allowed to turn in the card before the two weeks was up. I did this because I had several overzealous students and parents who would go home and read 25 books in just a day or two (or at least they said they did). I wanted them to take their time and savor what they read, not read it as quickly as possible to get to the next level. I love the reading bingo idea; I used it in the MS where reading books (like, read a nonfiction book, or read a historical fiction book of your choice) were several of the options, but they could also "write a review" on our OPAC catalog, create a board game with questions about a book for a reading group to play in the library, post on our library web page, etc. The kids loved it, but the problem I encountered was with the prizes. My prizes included "to the front of the lunch line" passes, a pen/highlighter/stylus combo, or a free paperback. As you experienced, the students would rush to get the bingo, choosing the tasks that took the least amount of time to complete, or even pretending to read books that upon a simple question (such as "what is this book about?") it was revealed that they didn't really read it, etc. For my middle school students, the library bingo met the objective of getting kids to visit the library and enjoy doing so, but it did not help me reach the objective of inspiring kids to read. Just thought I'd share. I wonder if I eliminate any prize at all whatsoever if they will participate anyway, and with less rushing (the having a minimum amount of time before they could turn it in didn't help either--most just forgot about it after they "finished it" in one day and I never saw their cards again). P.S. I love your blog; you have fabulous ideas and tips! I did this program last year, I am an elementary librarian. The kids LOVED it. Thanks for all your hard work! I was wondering how to do prizes for the classes that complete a class card. I allow prek, kindergarten, and grade1 do class cards. Unfortunately, I do not have any close-ups of the shirts I had made. We used a vendor that had a graphic designer on-site. I sent them an email describing what I wanted, and they sent me a design to approve or tweak. You might ask your local t-shirt vendor if you can do that. Or, I bet you could find someone on Etsy who could do a design for you for a low price. Then, just send it to a screen printer who does t-shirts in your area. My favorite one that I had created was "Reading Rocks" with little rocks reading books. I also had them create a design of our school mascot (a wildcat) reading a book. Hi Leigh, Could I please have an editable copy of your Reading Bingo card? Your email link has been deactivated. Thanks!